Blog What time is it? [Nirvana] – It’s easy to write success stories! But, SimRacing and maybe even real racing is not always about success stories. Often it’s about losing or frustration and only few say this! SimRacing is a permanent slip and fall. 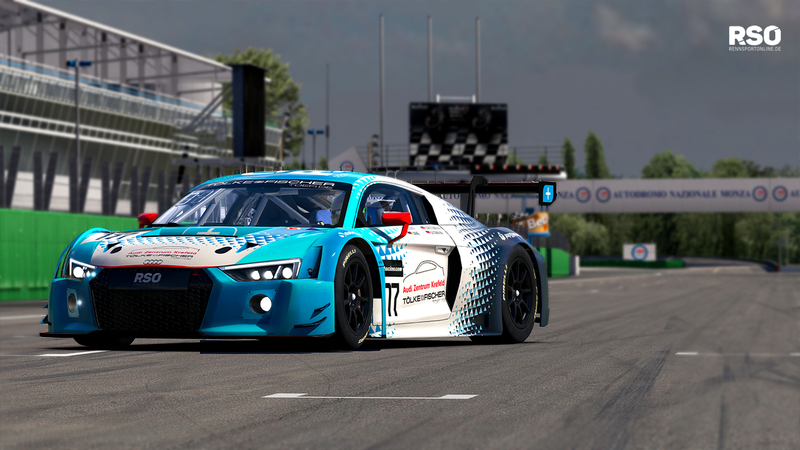 With only two races into the official qualifying series for the iRacing Blancpain World Championship Series, our goal – to qualify – is far out of reach and our dreams are over. Motivated and strongly encouraged by an incredible year of 2017 so far, we entered the road to WCS with two contenders, but already we have to quit this mission! With our experience of 2016/17 where we missed out the qualification by only two spots, we took things even more serious this time. Six weeks before the first race weekend of Monza, Phil, Cedrik, Tino, Tobi and Stephan started to prepare our new attempt. Hours and days of testing flew by: first, we were testing all possible cars to make the choice between them. It was tough to opt for one of the allowed cars: Should we go for the Mercedes AMG GT GT3, the BMW Z4 GT3, the McLaren M4-12c GT3, the Ferrari 488 GT3 or for the Audi RSO8 LMS GT3? Testing them on baseline-setup and on all of the six tracks, comparing them and then repeat the exercise with setuped cars, on all six tracks was a hell of work! 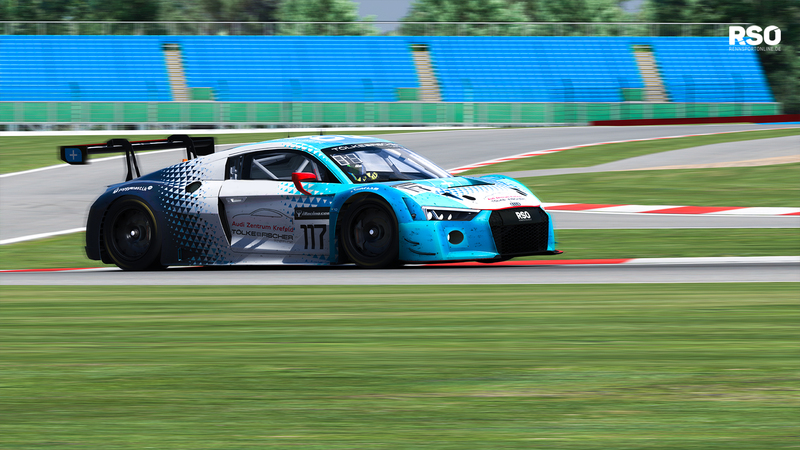 Second, we chose one of these GT3-beauties and went for the Audi RSO8 LMS GT3. Is was the most promising and allrounding car to us. And then, finally, we started to modify our setups to the maximum. It was all our guys could do to prepare for the first race weekend and by what we knew back then, our performance was okay, always within the Top20-teams’ test results. We were keen to fight for one of the rare spots for next years season! What a perfect example for what’s necessary to be competitive! …but soon it turned into certainty, that Team RSO will not make it to the World Championship! However, we knew that the highspeed circuit of Monza would be the toughest challenge as there were clearly some cars with an advantage in topspeed. Qualifying set us back to spots in the 30s, making it very hard to end up in the Top10. In all three races of the Monza weekend both of our cars had to take car contacts which left us behind with damage handicaps. Unable to score better than one P22, we left Monza knowing, that this weekend would be our drop-week. Only one week later, Silverstone should’ve been the turning point. With qualifying results in the high 20s, good race results were in reach. Indeed, some incidents dropped us out of any chances again and just when we were about to score a Top10-result in Saturdays early race, iRacing’s server issues disconnected us from the server…like one third of the field, too. Well, that’s it, story told and we are here empty-handed. Do you mind? SimRacing is serious sports! So, instead of describing how successful everything went, we’ll report on how dynamic and competitive our world is. Quitting the road to WCS is not only about some bad luck or certain circumstances, it’s also about many, many talented and super competitive rivals. During most of the days, this is what motivates and drives us, feeling the oldest of all feelings: the thrill of competition! When we were studying SimRacing as an eSport earlier this year, we could’ve found no better proof to underline the competitiveness of SimRacing than seeing 30 cars within one second regularly, where two tenths would decide over Top10 or Top40. The hype is real, and this qualifying series feels like a gold rush: overambition, high risk and success-oriented collaborations kind of change the game. Competition reached a new climax and lures more and more interest from outside. Interesting projects like FA Racing G2 pop up and feed SimRacing with their knowledge, opportunities and power, or will they eat us? Competition is growing: from track to off-track! 2017 shows the trend of growing topteams, assembling all the talented drivers, SimRacing even has its own silly season and new involvements like the one mentioned have the potential to reshape the competition. The whole environment of SimRacing seems to undergo the take-off stage and we are trying hard to establish ourselves. Even more than before, tasks and challenges behind the stage are exponentially evolving. Forming an association, sponsoring deals, news, media, accounting, networking, live-events, exhibitions, business development, research, real world jobs, hardware development, collaborations and many more new tasks, skills and challenges have to be tackled beside the virtual tracks. Suddenly, it’s not only about racing, virtual engineering or psychological strength after downs, normal tasks of a professional racing team entered SimRacing, too. To enable drivers to invest all the needed time like described earlier lies in the hands of perfectly structured teams! This reflects how complex our sport is already but still the influence of externally organized events shows how weak and sensitive our scene is at the same time. The lack of resilient structures is eventually critical. What time is it? There is no more time to waste! If SimRacing is developing so fast and all the tasks beside the tracks grow, not only in quantity but also in importance, why isn’t there any stage for teams? Why are all the drivers of the F1-eSports-finale dressed in F1-uniforms? Why are all the efforts of the teams behind the drivers unrecognized and unmentioned? Why isn’t there any surface for individual sponsors? As cool the whole event was, like WFG, too, SimRacing is not creating an own identity with these, it feels more like we are instrumentalized to generate publicity for others! In the middle of the gold-rush mood, where everybody seems to run for dough, it seems like a black box: what happens to the teams? Why are the finalists racing with F1-liveries and not their teams’? *That is a rhetoric question. Of course F1 has such strict and complex sponsorship deals, Pascal Wehrlein is not even allowed to sit in our simulator! Plus, we don’t count a teams’ link or hashtag as serious involvement or mention. We have no central platform which collects all the reports or which a user/interested person could consult for news on SimRacing. There are some vague but honorable attempts, but SimRacing clearly lacks visibility and news and reports aren’t dense enough for externals. …a lack of honoring and missing stages for all the efforts of the teams. Also iRacing itself isn’t consequent enough from our perspective if they don’t broadcast a single race of the WCS-qualifying races for example. Thanks to v8sonline who broadcast Saturdays early races we can witness some of the action but still iRacing itself which benefits the most from WCS doesn’t care about 400 teams trying to make it? iRacing’s only interest is to boast with the tip of the iceberg? It is sad in a way. And finally all this leads to the fact that there is almost no or few presence/surface for sponsors and partners of teams, which in reverse hinders their development although they are strongly influencing the environment in which their drivers are enabled to perform. Honestly, to quit the qualifying series so early is frustrating for us, as it takes away an attractive stage from us. At the same time it forces us to be even more innovative and find new ways within our dynamic, selfish and unreliable environment. For Rennsport Online one difference and hopefully advantage to many other teams is: we can rely on consistent team structures, talents and our friendship. As interesting the dynamic development of SimRacing is at the moment, we are worried and unsure which step to take next. The fast growing opportunities lead to a rude survival-of-the-fittest-contest where every decision can be critical. We pursue our belief that sustainable team structures, strong collobarations based on trust and common goals and hard work will help us to develop further. Always, we find strength in our team to regenerate from downs and uncertainty. But clearly, at least for this race we need luck and certain circumstances: the race for SimRacing!